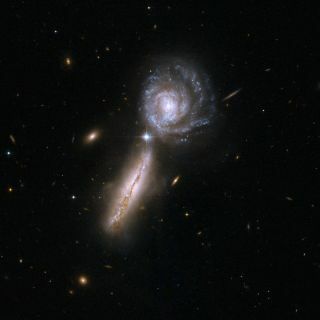 The galaxy pair UGC 9618 and VV 340, two spiral galaxies at the beginning of a collision. A sprawling collection of galaxies and star clusters surrounding our own Milky Way is challenging long-standing theories on the existence of dark matter, the mysterious substance thought to pervade the universe. The structure of satellite galaxies and star clusters around the Milky Way is so vast that it reaches across a million light-years – 10 times as wide as the Milky Way itself, according to astronomers at the University of Bonn in Germany, who made the discovery. Existing dark matter theories fail to explain the arrangement of these cosmic objects, the scientists say. "Our model appears to rule out the presence of dark matter in the universe, threatening a central pillar of current cosmological theory," said study team member Pavel Kroupa, a professor of astronomy at the University of Bonn. "We see this as the beginning of a paradigm shift, one that will ultimately lead us to a new understanding of the universe we inhabit." Dark matter is an invisible substance that is thought to make up roughly 23 percent of the universe. While dark matter has never been directly detected, it is inferred based on its gravitational effects. Astronomers estimate that the Milky Way contains 300,000 million stars in addition to extensive "arms" of gas and dust that reach out in a flat disk extending from the galaxy's central bar. The main part of the Milky Way is roughly 100,000 light-years across, which means that a beam of light would take 100,000 years to travel across it. In the new study, researchers noted that the different objects are distributed in a plane at right angles to the Milky Way's galactic disk. The massive, newly discovered structure stretches from as close as 33,000 light-years away from the center of the Milky Way to as far as 1 million light-years away from the center. By merging data from a range of sources to compile a census of our galaxy's surroundings, the scientists found that the area around the Milky Way includes bright "classical" satellite galaxies, plus fainter galaxies that were more recently detected, and globular clusters. "Once we had completed our analysis, a new picture of our cosmic neighborhood emerged," the study's lead author Marcel Pawlowski, a Ph.D. student at the University of Bonn, said in a statement. As the different companions orbit around the Milky Way, they shed material, stars and sometimes gas, which leaves long streams along their path, the researchers explained. The results of the new study show that this lost material is also aligned with the plane of the galaxies and globular clusters. "This illustrates that the objects are not only situated within this plane right now, but that they move within it," Pawlowski said. "The structure is stable." Existing theories of dark matter cannot adequately explain this galactic configuration, the researchers said. "In the standard theories, the satellite galaxies would have formed as individual objects before being captured by the Milky Way," Kroupa said. "As they would have come from many directions, it is next to impossible for them to end up distributed in such a thin plane structure." Signs of an ancient galaxy crash? The observations by Pawlowski and his colleagues suggest that other forces caused the unexpected arrangement of satellite galaxies around the Milky Way. "The satellite galaxies and clusters must have formed together in one major event, a collision of two galaxies," study team member Jan Pflamm-Altenburg, a postdoctoral researcher, said in a statement. Such galaxy collisions are relatively common, and typically result in large chunks of galaxies being torn out by strong gravitational and tidal forces. These violent interactions sometimes form tails that become the birthplaces of new objects such as star clusters and dwarf galaxies, according to the researchers. "We think that the Milky Way collided with another galaxy in the distant past," Pawlowski said. "The other galaxy lost part of its material, material that then formed our galaxy's satellite galaxies and the younger globular clusters and the bulge at the galactic center. The companions we see today are the debris of this 11-billion-year-old collision." The study's findings are detailed in the journal Monthly Notices of the Royal Astronomical Society.